The Laws of Likability get more interesting with each passing day. Up until recently, I didn’t really think about which law trumped the rest, but I’m getting closer. Had you met Sara Palin in a coffee shop prior to John McCain selecting her as his vice presidential running mate, there is a very good chance you would have liked her immediately. How could you not? She’s attractive, has a nice smile and she’s personable. This is the power of like and dislike by affiliation. If you’re a Republican, you saw Sara Palin as heroic, dedicated, and an agent of change that was good for America. 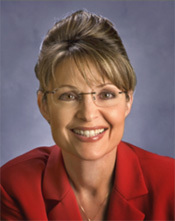 If you’re a Democrat, you saw Sara Palin as untrustworthy, dishonest, incompetent and maybe even a little disingenuous. And to think that just a minute ago she was nothing more than a lovely person you were having a delightful conversation with in the coffee shop. That my friends is the power of like/dislike by affiliation. What does that tell you about how people are going to feel about you based on your political views? It should tell you that they’re either going to like you more or like you less. And how they are going to feel about you is determined by the conversation you choose to have … or not have. Here’s my advice … but only consider taking it if you want to keep your front teeth. If you discover that your companion is of a political view that is similar to your own … share your feelings openly. In doing so, the person you’re with is going to be more attracted to you. If the person you’re with holds a different political view, change the conversation to another topic. It’s OK. No one is holding a gun to your head forcing you to share your views. If for some reason you feel compelled to explain why you’re a Democrat, a Republican or a Libertarian, just know that you will create a feeling of dislike and could soon find yourself having that conversation alone in a corner. People judge you by who you associate with and they do it with a vengeance. If the association is good, take advantage of it. If the association is not so good … be diplomatic and change the conversation. Please tell me if this situation has ever happened to you and what you learned from the experience in the comment section below.